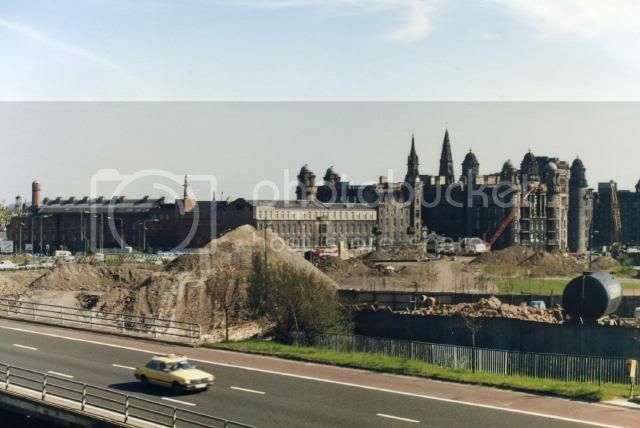 The Hidden Glasgow Forums • View topic - It's all up hill from Bridgeton. It's all up hill from Bridgeton. Gizzi, the ice-cream man, Glasgow. Guiseppe Gizzi, with his ice cream barrow at the corner of Wishart Street, James Orr Street and Glenfield Street, around 1937. His sales pitch covered miles of streets in Glasgow's east end where he pushed his barrow daily, switching in the winter to roasted chestnuts. The building behind the barrow is the boiler house of the Glasgow Royal Infirmary. James Orr St. is the one dotted in Orange, it exits onto Wishart St. The top ends of Glenfield St. & James Orr St. would exit onto Alexandria Parade. 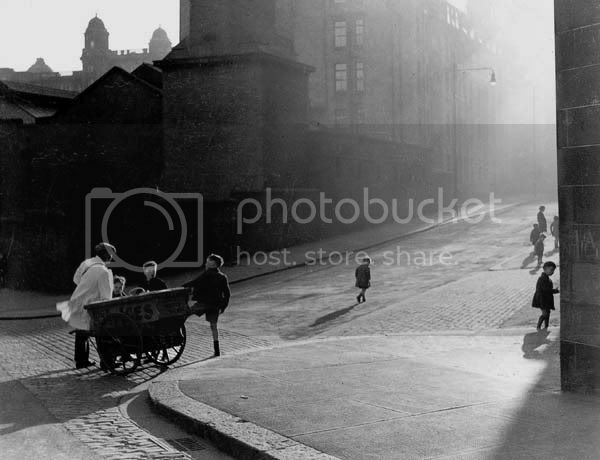 In the 'Gizzi, the ice-cream man' photo by Andrew MacDonald, the pov would seem to be looking directly up Warnock St. 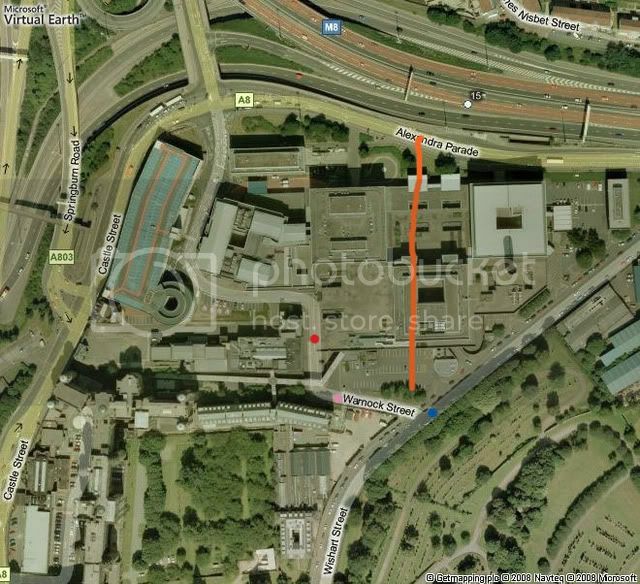 The 'cobbled’ exit from James Orr St. can be seen at bottom right. 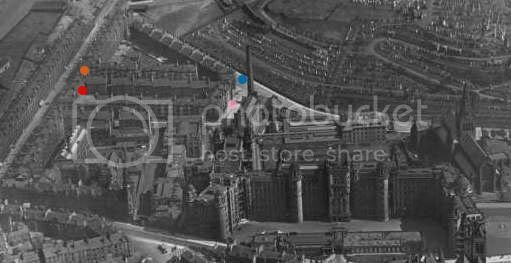 At first I thought that Glenfield St. originally doglegged onto what later became Warnock St. 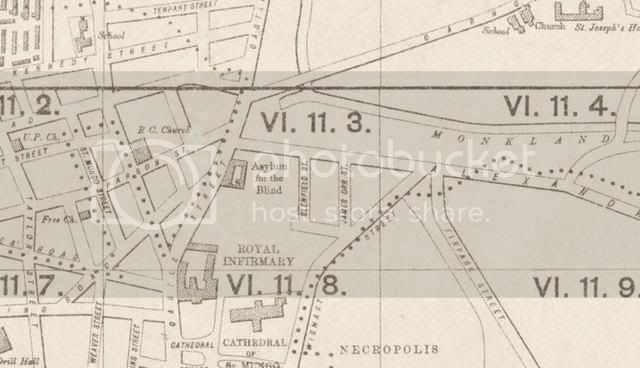 But looking at this map from 1909, it would seem that Warnock St. was already in existence. So, is the photograph caption is wrong? The boiler house chimney stack can be seen in both photographs. By an amazing co-incidence, this photograph surfaced on another Glasgow site the other night. It was taken by 'Kev9' sometime during 1983/4. Apart from the hospital and the Blind Asylum immediately to it's left, everything else has gone. The low building with the cream top storey is now the multi storey car park. 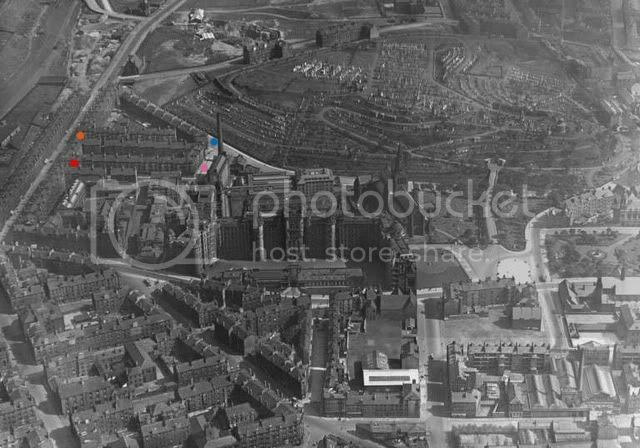 To the rear can be seen what is left, if anything, of the Glenfield St. area, it's too difficult to pick out the details on the buildings, the boiler house chimney stack is there as a ref. 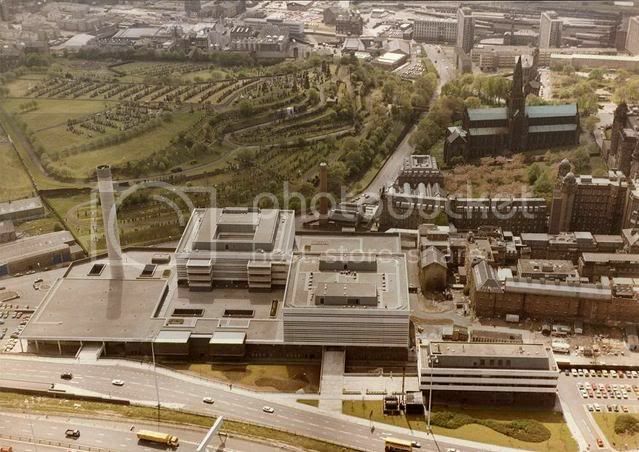 Since 1974, the Greater Glasgow Health Board had envisaged the replacement of the original buildings with a brand new hospital, but only the first phase of this was ever realised - the New Building was completed in 1983. 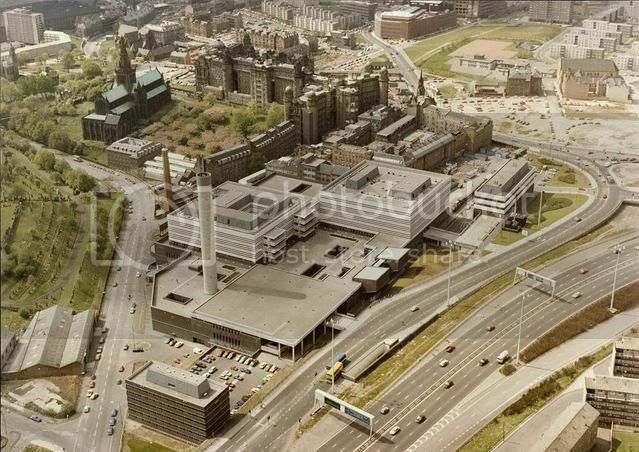 It is located on the north of the hospital site overlooking Alexandra Parade and the M8 motorway, and is linked to the Surgical Wing of the original Royal Infirmary building at basement level via a link corridor, with a further pedestrian entrance at lower basement level on Wishart Street (adjacent to the Necropolis). After the closure of the Rutherglen Maternity Hospital and the Glasgow Royal Maternity Hospital, a new maternity building was added to the east of the New Building; the Princess Royal Maternity building opened in 2001. Following the closure of Canniesburn Hospital, in 2002 the Jubilee building was opened, adding purpose-built Accident & Emergency facilities and a plastic surgery unit. The Infirmary now has over one thousands beds. 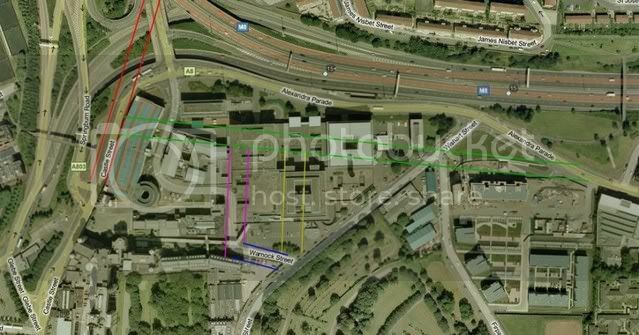 An evaluation was carried out in August 2004 in advance of a proposed car park. 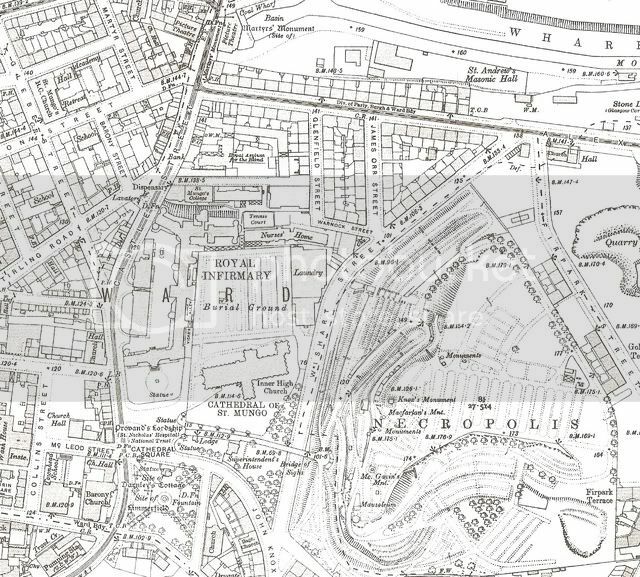 Numerous building foundations were identified, dated to the 19th century, many on the 1st edition OS map. A tunnel or drain, most likely related to the Monklands Canal Basin, constructed by 1782 and located to the N of the area, was identified in the northern part of the development area. No original ground surfaces were identified, and it would appear that there has been extensive landscaping and terracing over the entire area. As a result, no remains dating to before the 18th or 19th centuries were identified. Ross, re the pic of the Ice Cream man on Andrew McDonalds site. Well he lived in Bridgeton, I went to school with his kids,his cafe was in Main St ,next to the "Wee Royal" picture house, to put things into perspective,in that pic, he was up near the Royal Infirmary. So he has walked there, all the way from Bridgeton, up all those hills pushing a barrow. Funny thing!! the ice cream man is just passing as I write. Joe Gizzi's barrow did not play Greensleaves !! I’ve no doubt that some of the dates & opinions stated above will be in need of correction, please feel free to add any info you may have. NB: Aerial colour photos courtesy of My Kitten. Re: It's all up hill from Bridgeton. You know what all this tells us? Saddo is as saddo does? Nice research, BTW. Lovely picture. I always thought it was just off of Great Western Road for some reason and it so obviously isn't. Good to be corrected. Last edited by Anorak on Thu Jan 22, 2009 9:06 am, edited 1 time in total. 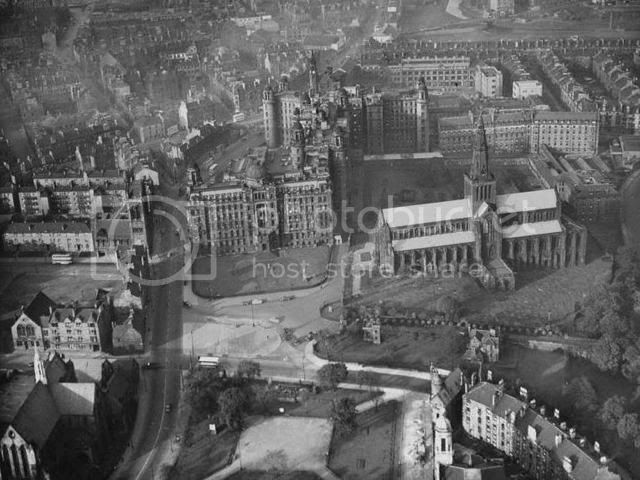 parts of the Royal Infirmary obliterated the original part of Alexandra Parade. 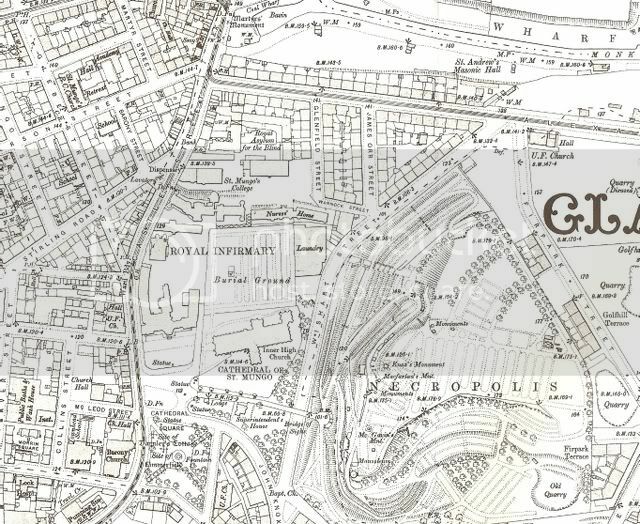 Happily, it would seem that Glenfiel St. still exists to some extent. Excellent stuff, I did wonder what you were going to do with them! Another view of Glenfield St.
early 1960's from the bus and when was King Billy moved to the square? Dexter St. Clair wrote: when was King Billy moved to the square? The statue was presented to the city by James Macrae, of Orangefield in 1734 and erected outside the Tontine Hotel, Glasgow Cross, in 1735. It was moved to an adjacent site in 1894 due to the building of a railway station at Glasgow Cross, and then moved in 1923, to J & G Mossman's High Street yard for repairs. The tail was damaged at this time and was re-affixed (for some unknown reason) with a ball and socket joint which causes the tail to swing in the wind. A new pedestal was made and the English translation of the Latin inscription cut. The original Latin inscription was transferred onto the new pedestal. The statue was erected on its present site in 1926. Until the mid-19th century there were four canon barrels, placed muzzle upwards, at the corners of the pedestal. These were relics from the Battle of the Boyne (1690), William's greatest victory over King James VII and II. Two were sold to a scrap iron merchant in the 1850s when the council erected urinals adjacent to the ends of the pedestal. The other two were moved with the statue in 1894 and enclosed within the decorative wrought iron railings which were erected around the statue at that time. These were scrapped prior to the 1923 relocation. Unspecified repairs (costing £110) were made to the statue in 1951, as per the recommendations of a report submitted to Glasgow Corporation by the City Engineer. 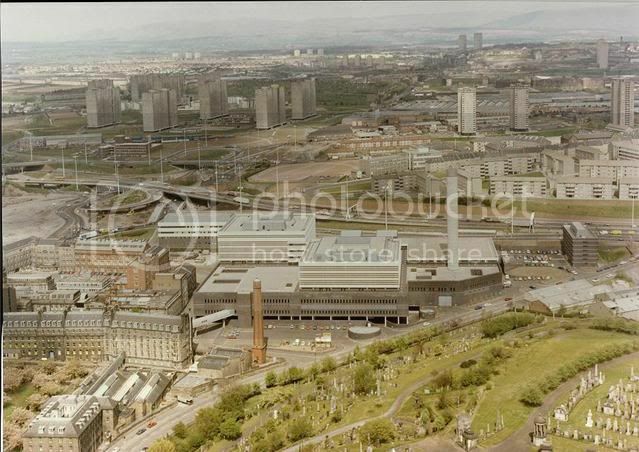 Great photo, this place is completely overshadowed and hidden by the modern part of the GRI. 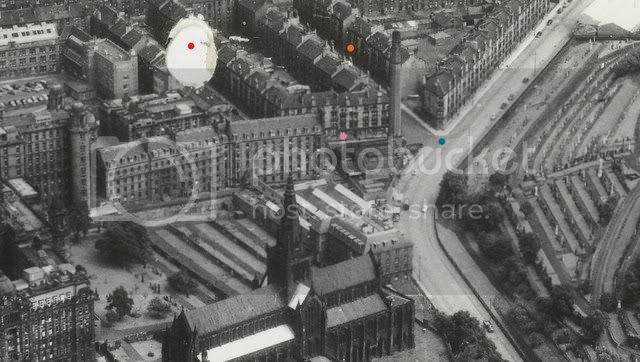 Although i think the more modern looking building to the extreme left of the photo still exists to some extent. I'll check it out. I wish the photo covered slightly more to the left as there should be an entrance to the Walton Buidling (previously Nurses quarters). Knightmare wrote: I wish the photo covered slightly more to the left as there should be an entrance to the Walton Buidling (previously Nurses quarters). 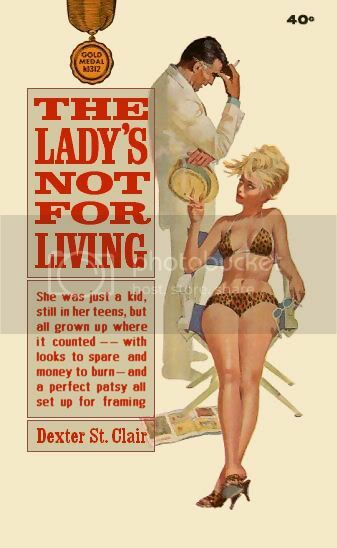 Away, ya durty wee bugger!